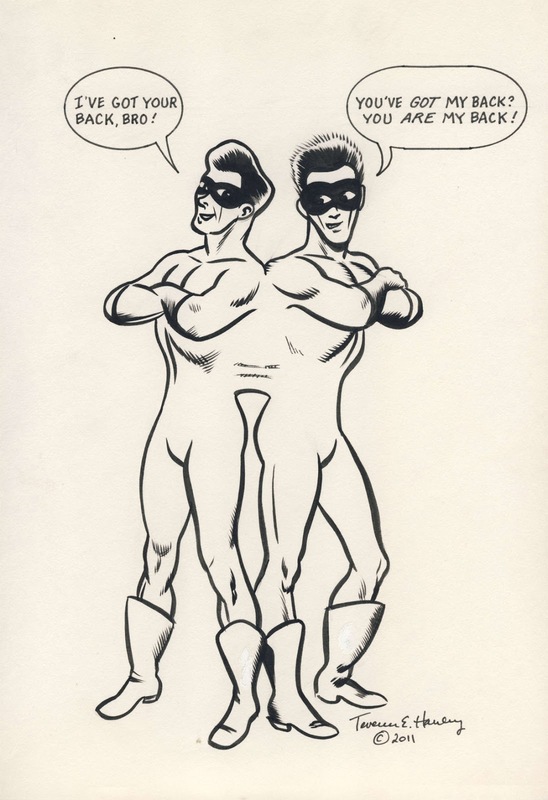 The Amalga-Mates: The World's First (and Second) Siamese Twin Superheroes! Tim Corrigan penciled and lettered the first part of "The Case of the Nutcase" for Five Star Comics #2, published in Spring 2012. Larry Blake, Gary Gibeaut, and I, calling ourselves "Many Hands," inked it in February, shortly before publication. At about that time or a little after, Larry penciled the second part of the story and sent it to Tim for his letters and inks. Tim was fast and finished the job in short order, but we didn't get around to publishing Part Two until Spring 2013 in Five Star Comics #3. The script on both parts was mine, with changes and additions made by Tim Corrigan. Each part of "The Case of the Nutcase" has a different look to it. You would expect that, knowing that different artists worked at different tasks on each part. For example, Tim used a fine pen for his inking of Part Two. His touch was light. That lightness of touch was helped by Larry's use of drawing board measuring about 11 x 16 inches. That gave Tim plenty of room to work. Larry's penciled art is about 10 x 15 inches, a standard size for comic book pages. Comic book publishers of course reduce their pages by about one-third for printing, thereby sharpening the image and making fine lines even finer. That's standard practice in Five Star Comics, too, and it improved the look of Tim's already very fine inking. Tim, on the other hand, used board measuring 8-1/2 x 11 inches for Part One. His original art is about 7 x 10-1/2 inches. In other words, the original art is not much bigger than the printed size, which is about 6-1/8 x 9-1/8 inches. As I understand it, Tim always worked fairly small. That tendency is probably explained by the fact that, when he was a kid, Tim was unaware of the concept of photomechanical reduction. He thought artists worked at the size their art was printed. Maybe Tim's light touch was a result of working in smaller dimensions. If so, maybe we should thank childlike naïveté for the many fine lines that flowed from Tim's pen. For what it's worth, Franklin Booth (1874-1948) made pen-and-ink drawings that looked like engravings because, like Tim, he thought the artists of his childhood drew that way. He didn't know that the illustrations he saw in books, magazines, and newspapers at the time were printed from engraved blocks of wood. Tim's small drawing paper on Part One was good for his own purposes, but it posed a challenge for us as his inkers. The surface of the paper Tim used is fairly glossy, too. It doesn't take a pen line very well, and the pencils are hard to erase. Also, we were rushed (as comic book artists so often are), and we didn't do what we would have considered our best work. In the end, Larry, Gary, and I are responsible for the coarse and heavy look of Part One of "The Case of the Nutcase." The gray tones I added using Photoshop--a first for me--only added to its heaviness. As you might guess, I prefer the look of Part Two to Part One, and I think the story in the second half works better as well. About midway between the publication of the two parts of "The Case of the Nutcase," Tim Corrigan announced his retirement from comics and small press. That was in November 2012. I wonder now if "The Case of the Nutcase," Part Two, was Tim's last published comic book story. In any case, in retiring, Tim wanted to spend more time on his music and with his family. Last summer, on August 22, 2015, Tim died unexpectedly at his home in New York. He was only sixty-four years old. Tim was Irish and I am Irish. He looked like he could have been one of my dad's brothers. I like to think that we had a shared heritage, not only going back to the Emerald Isle but also to a childhood love of the comics. He was funny, easygoing, good-natured, enthusiastic about comics, and supportive of other artists and of small press in general. Invariably dressed in a flannel shirt, with a long, gray ponytail down his back and glasses perched on the end of his nose, he liked to roll his own cigarettes and devour popsicles, one after another. He read a comic book I drew when I was about ten years old and, perhaps remembering his own childhood of drawing comics, treated it with tenderness. He called it charming. We might say the same thing of Tim Corrigan. 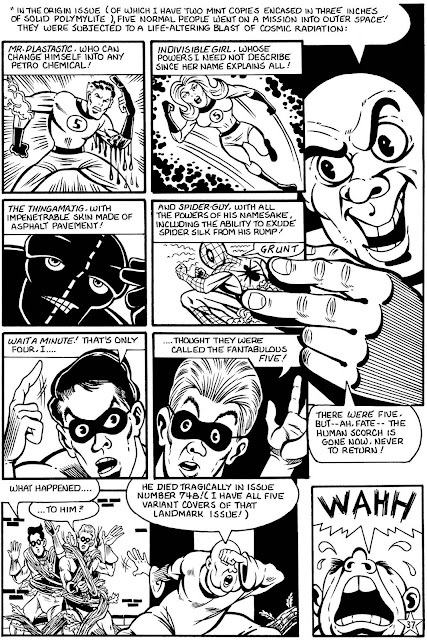 The first page of "The Case of the Nutcase," Part One, from Five Star Comics #2. Tim Corrigan penciled and lettered the story, while Larry Blake, Gary Gibeaut, and Terence Hanley inked it. A page from "The Case of the Nutcase" Part Two, from Five Star Comics #3. Once again, Tim lettered the story, but those are his inks over Larry Blake's pencils. Note the fineness and precision of Tim's line. I meant "The Case of the Nutcase" to be a send-up of superhero comics, but that doesn't really come out until Part Two and the sequence about The Fantabulous Five . . . minus one, the unfortunate Human Scorch, who "died tragically in issue number 748," a "landmark issue" of "The World's Greatest Comic Book." Five Star Comics began in 2011 as an anthology of Golden Age comic book characters that are now in the public domain. Our first issue included stories of Moth Man, Silver Streak, Marvel Maid, Flip Falcon, and Cave Girl. With our second issue, we began telling stories of our own original characters, first of which were a pair of Siamese twin brothers, code-named The Amalga-Mates. Their identities are secret. (That's part of the fun.) When they aren't fighting crime, the two are millionaire philanthropists Hemsworth V. Hemsworth (pun intended) and Semyon Hemsworth. For short, they call each other Hemi and Semi (more puns intended). Hemi and Semi came into my imagination in a way I can't explain exactly. There they remained until a Saturday afternoon in April 2011, when Larry Blake introduced me to Tim Corrigan at the Small Press and Alternative Comics Expo (S.P.A.C.E.) in Columbus, Ohio. Larry had shown Tim some of my work. I felt honored when Tim asked if I wanted to collaborate with him on a story. I said yes, but I didn't know what we would do for a collaboration. He said think about it, so I thought about it as I drove home that evening. The idea came to me as I was driving, one I had sketched three months before. The next morning I drove back to Columbus for the second day of S.P.A.C.E. 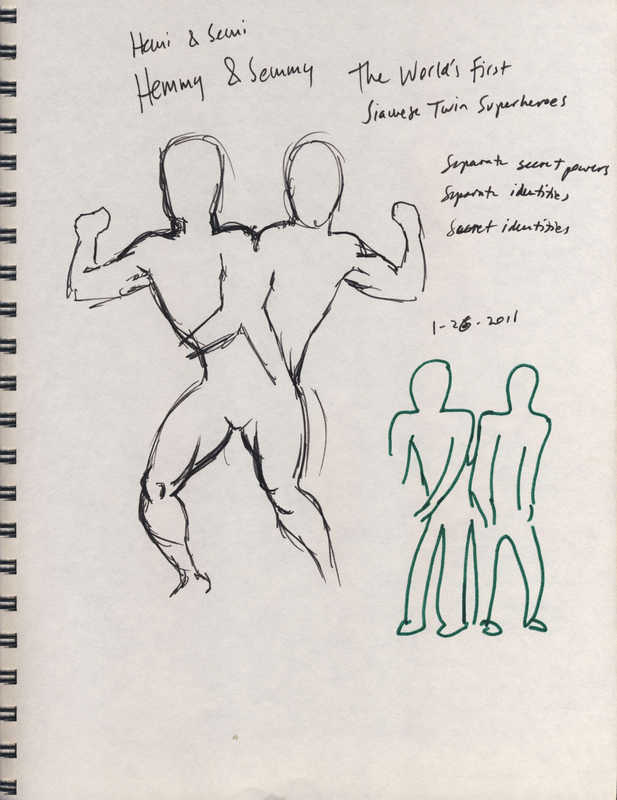 When I saw Tim, I told him of my idea for a story about Siamese twin superheroes. "No one has ever done it before," I explained. "There's a good reason for that," he laughed, with tears coming into his eyes. But he agreed to it and asked me to send him a script. Things get away from us. Nearly six months passed before I mailed a script to Tim in November 2011. He called me on the day he received it. He had just finished reading it and was laughing again. Anyone who knew Tim knew his laugh and his great sense of humor. He liked the script and told me he would start drawing. Tim and I agreed that our story of the world's first Siamese twin superheroes would be a true collaboration. Although I had written the script, I wanted him to feel free to add to it or make changes. One change came out just right. I had tentatively called my heroes "The Titanic Twins." "That's kind of a weak name," I admitted in a letter to him. Tim came up with something better, and that's how Hemi and Semi became The Amalga-Mates. Tim also changed the title of the first story from my original "Nuts to the Nut" to "The Case of the Nutcase." Tim was a great maker of signs, logos, titles, and sound effects. (For evidence of that, consider the "GA-JEEZ" and "SHAZEAMPPP!" on page 28 of FSC #2.) The Amalga-Mates main title is his creation alone. Tim was a fast worker. Not long after the new year, 2012, began, he called to tell me that he was working on the story, but that he couldn't make it fit into ten pages, which was about what I had envisioned. He sounded a little worried. I confess that I get a little long-winded in my stories, and I always underestimate the number of comic book pages it takes to tell a story. I was just learning then. I still don't have a formula down. At the time I thought one page of script would equal about one page of a comic book story. Now I know that it's more like two to three pages of comic book story per page of script. Anyway, I told Tim that we could break the story roughly in half, run the first half in Five Star Comics #2 and the second half in issue #3. He sounded relieved. Not that there was any reason to worry. Tim finished the penciling and lettering of Part One of "The Case of the Nutcase" in February 2012. Larry Blake, Gary Gibeaut, and I collaborated on the inking (I was supposed to have done the inking on my own), and the story went to print in time for S.P.A.C.E. in April 2012. I suppose it's only fitting that a story about Siamese twins would have two halves. The second half would have to wait until Five Star Comics #3. 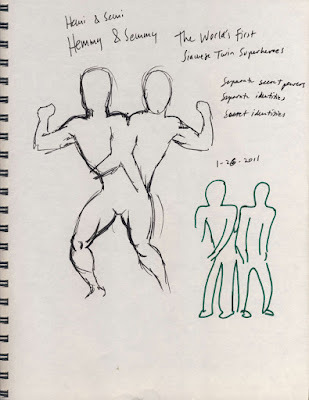 The first drawing of the characters that would become The Amalga-Mates, by Terence E. Hanley, January 26, 2011. The drawing in black came first. Note that the twins have just two legs and that their arms are conjoined. The smaller drawing in green came next and is about how Hemi and Semi turned out in the end. In case you're keeping track of these things, The Amalga-Mates were born on today's date five years ago, so, Happy Birthday, Hemi and Semi! My first finished drawing of the twins, from 2011. I sent a copy of this drawing to Tim Corrigan as a character sheet. As you can see, The Amalga-Mates wear masks so no one will know their true identities. Hemi and Semi have distinct personalities. The easiest way to show that, I thought, was to draw them with different hairstyles. (How else are you going to tell them apart?) That difference shows up in this drawing, but in the final comic book story, the difference is even more pronounced, as Hemi (on the viewer's left) has dark hair, while Semi (on the viewer's right) has blond hair. So how do Siamese twins, which are by definition identical, have different-colored hair? Does one color his hair? Does the other bleach his? These are questions for another day. To set them apart a little more, I was going to make one of the brothers a little more savvy than the other. In my original script, that was Hemi, the leader and the twin on his own right. Tim had other ideas. He made Semi, the brother on the twin's own left, at least an equal to Hemi, and maybe a little smarter. I asked myself why Tim had made that change. Then it occurred to me. Tim was left-handed. Beck was and is a widely admired artist. His Captain Marvel stories from the 1940s are considered classics. They were so good, in fact, that Fawcett, for a time, represented one possible paradigm for the future of comic books in America. Instead, Fawcett was sued out of business, and eventually all comic books, for better or worse, became Marvelized. The general public has very little knowledge of what is right and what is wrong. It has practically no taste; it will accept almost anything that is presented to it, no matter how bad it is or how poorly it is made. Nobody can change the public, which has always been this way. The best thing that can be done is not to offer the public things which are in bad taste and which degrade both the public and the producers of products. Writers and artists should be able to tell bad writing and art from good, even though their public (and sometimes their publishers) can't. . . . Some comic book publishers believe in giving readers anything they think they want. . . . Catering to the tastes of the lowest members of society . . . is what makes civilizations go down the drain. History proves this; when literature and art start to degenerate, it's a sign that the public is not getting what it needs but what it needs least: pandering to the wants of the lowest, most mindless of its members. Beck was obviously conservative in his views, not necessarily politically conservative, but at least culturally conservative. We could take his words as those of a curmudgeon, a grouch, a crank, or a guy sitting on his porch saying, "Hey, you kids, get off my lawn!" You can decide for yourself whether there is wisdom in what he wrote or something else. 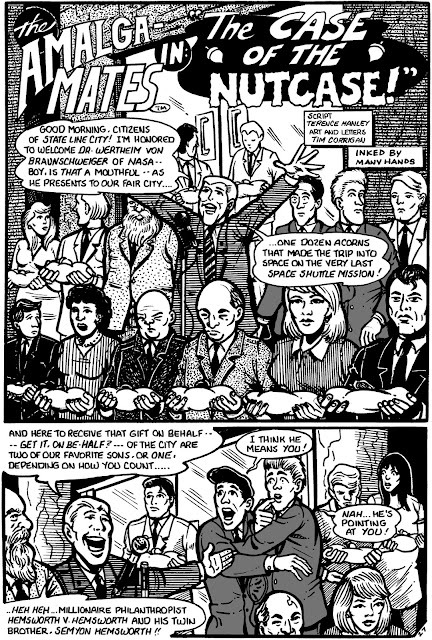 But I think he was on to something, and though I didn't read his essay until after we had begun publishing Five Star Comics, I think we, the six original creators, had a sense that he was right. It's why we decided against the tastelessness, violence, gore, misogyny, nihilism, and amorality or moral relativism of contemporary culture in making our comic book. We may sometimes miss the mark, but that isn't because we aren't shooting for good writing, good art, and a positive and uplifting tone. Our comics, like each one of us, is a work in progress. The Black Bat, like most of the characters in Five Star Comics, is a Golden Age character in the public domain. The difference is that The Black Bat is not from the Golden Age of comic books but from the pulp magazines of the 1930s through the 1950s. Other pulp characters have been adapted to comic books. The Shadow, drawn by Michael William Kaluta for DC Comics in 1973-1974, is a notable example. Matt Marshall's adaptation for Five Star Comics #2 is perhaps unique for its halftone art and its Prince Valiant-like narrative. The Black Bat has appeared in other comic books, though, and will no doubt go on appearing for a long time to come. It's a popular and intriguing character with fans all over the world. Those fans include a blogger who goes by the designation TSOG. TSOG hails from Ontario, Canada, and writes a number of blogs, including The Colony of the Black Bat, about all things black and batty. You can read his blog by clicking here. TSOG has written about the Five Star Comics version of The Black Bat twice, first on May 12, 2013, then again on May 26, 2013. That was awhile ago, but we thought you would like to know. Besides, TSOG's blog is as thorough as you can hope for. It even includes German covers from the 1970s. So click and start reading today. Point Pleasant, West Virginia, is a small city but rich in history and folklore. It is the site of what some people consider the first battle of the American Revolution, the Battle of Point Pleasant (also called the Battle of Kanahaw), which took place on October 10, 1774, between Virginia militiamen and a force of American Indians under Chief Cornstalk. 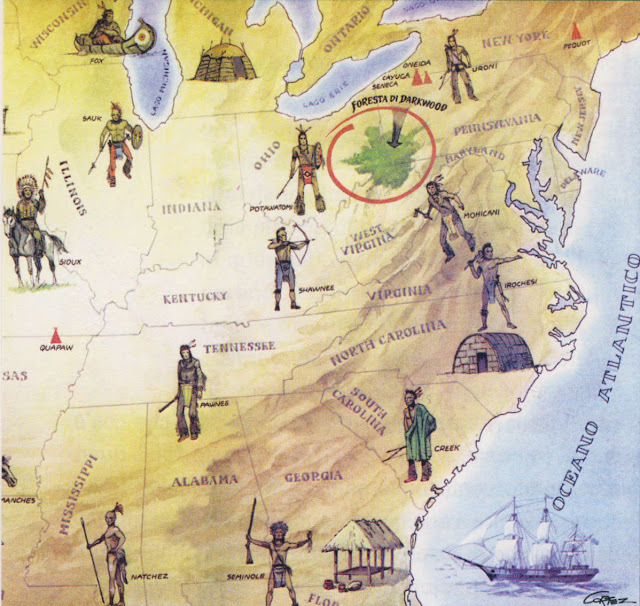 The Shawnee chief and his warriors were defeated in the battle. Long after his execution by his American captors in 1777, people claimed that Cornstalk had pronounced a curse upon white men. The first sightings of Mothman in 1966 and the collapse of the Silver Bridge in 1967 are said by some to be the fulfillment of Cornstalk's Curse. Point Pleasant has other claims to fame. Karl Probst, designer of the Jeep, was born there. Brigadier General John McCausland of the Confederate army lived and died there. Few in America know it, but Point Pleasant also lies at the edge of the la Foresta di Darkwood--in English, Darkwood Forest, a creation of an Italian writer named Sergio Bonelli and the setting of Bonelli's long-running comic book feature Zagor. Born in Milan, Italy, on December 2, 1932, Bonelli was the son of a writer, Gian Luigi Bonelli (1908-2001). To avoid confusion, the younger Bonelli adopted a nom de plume, Guido Nolitta. He began his career as a writer of comic book stories in 1957. In 1961, he created, with artist Gallieno Ferri (b. 1929), the comic book character Zagor. As Guido Nolitta, Bonelli wrote nearly all of the Zagor scripts, from Zagor #1, dated June 15, 1961, to Zagor #187, published in 1980. Zagor, created by writer Guido Nolitta (Sergio Bonelli) and artist Gallieno Ferri for the character's self-titled comic book, published since 1961 by Sergio Bonelli Editore. 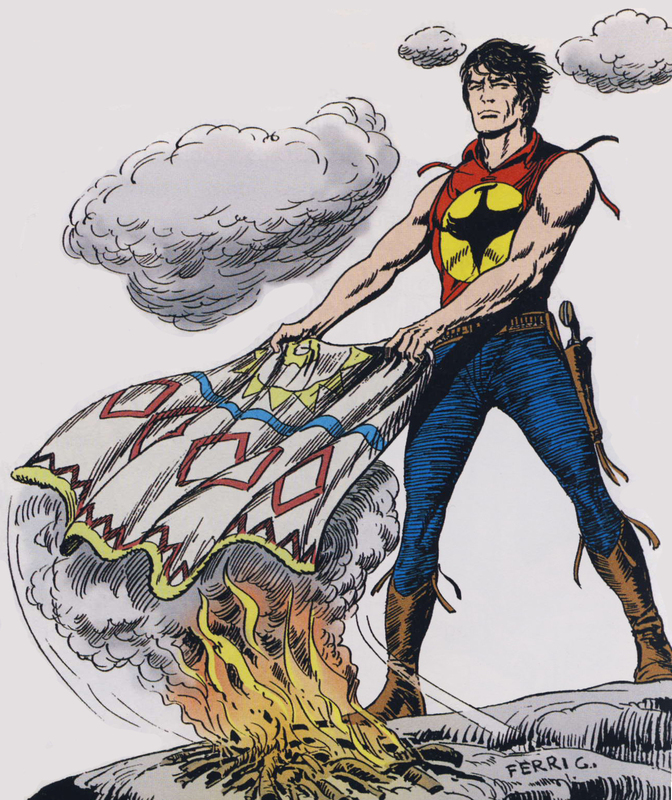 Zagor is an adventurer on the American frontier of the early 1800s. Like James Fenimore Cooper's Leatherstocking, he inhabits a romantic world that never was. Clad in blue pants and a red, sleeveless shirt emblazoned with a yellow and black insignia, Zagor has the look of a superhero. Agile, strong, and indefatigable, he runs, jumps, swings, paddles, shoots, and punches his way across a fantastic landscape inhabited not only by woodland Indians and white frontiersmen but also by cowboys, cavalrymen, a tribe of uomini pipistrello--Batmen--and even a Ming the Merciless-like villain named Marcus. Zagor's sidekick is Felipe Cayetano Lopez Martinez y Gonzales, nicknamed Cico (pronounced Chico), a short, round, mustachioed Mexican in a green suit, string tie, and sombrero. (He's in the second and third panels of the comic book story below.) A comic character in the mold of Sancho Panza and the Cisco Kid's sidekick, Pancho, Cico is often in need of rescuing. Point Pleasant, a small cluster of huts, a necessary staging place for all shipments going upriver to Fort Henry and Fort Pitt . . .
No, Darkwood [the forest of the title] does not exist; I have made it up myself. And I would add that I have invented it only little by little (in fact, in the first issues, the idea was only hinted at) as it became more and more necessary to have Zagor act in a "closed" setting but at the same time "open" to all possibilities of adventure. 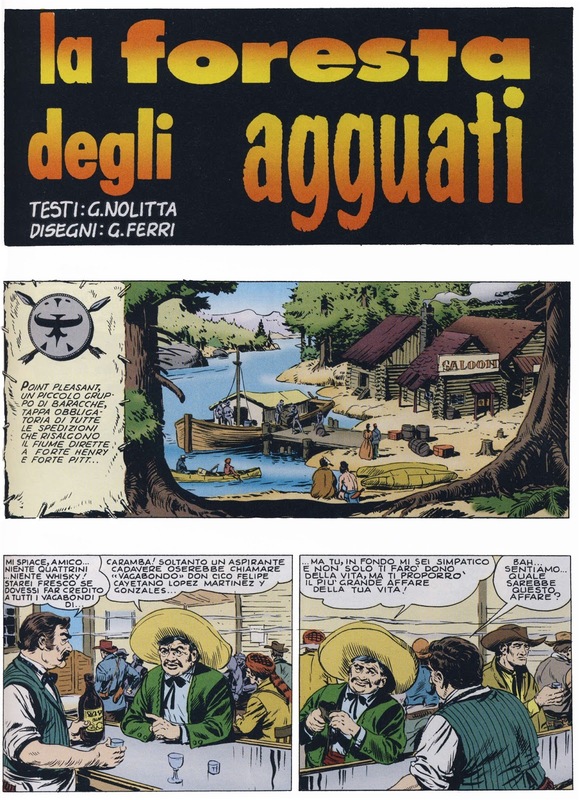 Despite the fact that Zagor's first comic book adventure began in Point Pleasant, that "little cluster of huts," as it was described, lies beyond the bounds of the forest as mapped by Cortez. In fact, it's outside the red circle drawn on the map, in the second loop of the Ohio River below and to the left of Darkwood Forest. Never mind that, though. Point Pleasant is where we meet first Cico, then, somewhere along the Ohio River, the hero Zagor. In later adventures, Guido Nolitta populated Darkwood Forest with mad scientists, vampires and vampiresses, medieval knights, prehistoric men, and fantastic creatures. In 1966, another fantastic creature visited Point Pleasant. I wonder if that creature--Mothman--is a remnant of the strange and mysterious Foresta di Darkwood. Sergio Bonelli, aka Guido Nolitta, died on September 26, 2011, in Monza, Italy.